The pressure caused by transport depends on the force (weight) on each wheel. The figure below indicates the the pressure at different depths for wheel force 75 kN (7500 kg) with dynamic factor 1.75. This calculator is based on the equations below and can used to estimate the underground pressure acting on objects relatively smaller than the depth they are buried - typically pipes with diameter less than 3-500 mm. Pressure from transport is calculated for wheel force 75 kN (7500 kg) with dynamic factor 1.75. Engineering ToolBox, (2018). Pressure acting on Underground Pipes. 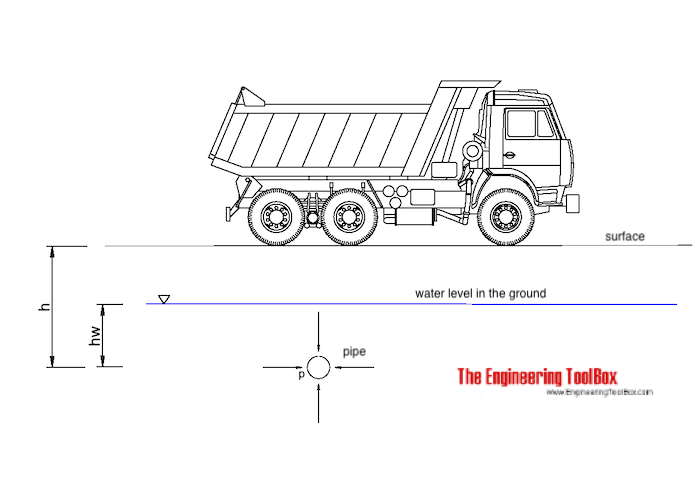 [online] Available at: https://www.engineeringtoolbox.com/underground-pipe-pressure-soil-transport-d_2145.html [Accessed Day Mo. Year].